1. In a small bowl, desolve the yeast, 4 tbsp water and 1 tsp sugar let sit for 5 minutes. 2. In a large bowl, combine the flour, water and yeast mixture. Add salt and knead until a rlastic dough for about 8 minutes. 3. Oil a medium bowl, place the dough into the oiled bowl. Brush the top of dough with oil. Cover with plasric wrap and allow to rise for 90 minutes. 4. Line a baking sheet with 2 sheets of parchment paper. 5. On floured surface, cut into 4 equal pieces, roll each piece into a 12 inch rope and place them on lined tray. Place the dough logs evenly spaced lengthwise on the flour dusted parchment. 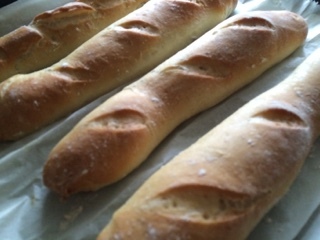 Using a sharp knife, make 5-6 diagonal cuts across each baguette. 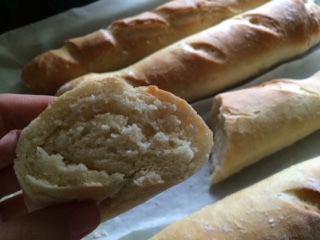 Lift the parchment paper in between each baguette and crease to separate each one. Dust the tops with some flour. Cover the baguettes with a clean tea towel and leave for 30 minutes, or until the dough has at least doubled in size. 6. Preheat your oven to 230c/445f. Fill a heated roasting tray with 500 ml hot water, to create steam, and put the bread into the oven. 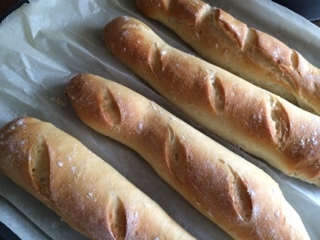 Bake for 20-25 minutes, or until the baguettes are golden-brown. 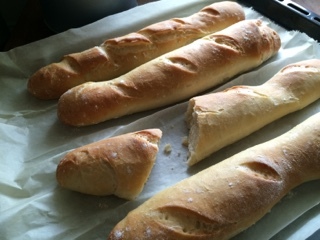 The baguettes turned out great! Thanks for the recipe! Would you add the conversions to cups and tablespoons and teaspoons?